Having your packaging, or other product, produced overseas comes with its fair share of risks. Here’s how to prevent some common quality issues. We realize this is not possible in all scenarios, but having someone on site at the manufacturer to monitor production is the ultimate way to prevent any quality issues that might arise. Having someone on your team that will be able to effectively communicate updates and issues before production units are shipped, is absolutely ideal. Make it clear that you will not approve production without first article physical samples. You need to have the product in hand to evaluate any unforeseen issues with quality that cannot be seen via photo or video. When changes are necessary, make sure to use very detailed photos and drawings to communicate with the factory. Your timeline is important when launching a new product. Supplier lead times may initially sound appealing, but they are often not accurate due to a variety of variables that might delay the process. 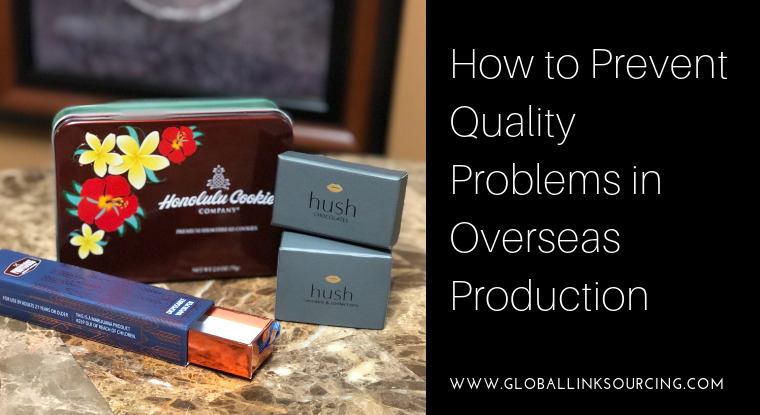 Make sure to give yourself plenty of time to deal with any quality issues that might arise, so that you are not sacrificing anything in order to have your product arrive on time. Another reason not to rush production, is that overseas manufacturer quality will always suffer if lead times are rushed. Sourcing and manufacturing overseas can carry significant risks if you don’t know what you’re doing. Without someone to rely on to review production for quality assurance, you could risk receiving low quality or defective units and a whole host of issues that ensue. Avoid the risks of sourcing overseas by working with a trusted supplier. With offices in the US and a team of expert quality assurance employees in China, GLS has you covered. Get in touch today and we can help you with anything from designing your packaging to sourcing a new product.